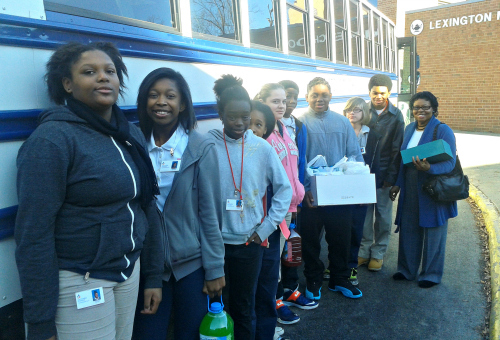 Lexington Middle School students prepare for a trip to the Lexington Health Care Center to host a Valentine’s Day party for the residents. The 2013/14 school year has been swift, exciting and, as always, challenging. The year began with dual excitement of enrolling new students in the program as well as trying to put names and faces with approximately 30 new staff members at Lexington Middle School. Our older CIS students are always interested in knowing what the activities are going to be for the year while our sixth grade students are just overwhelmed that middle school means not only having a lunch buddy, but getting to participate in events throughout the year. My greatest challenge this year has been getting students motivated enough to meet the academic goals that they are capable of achieving. This year we had twelve applicants who were eligible and willing to go to Camp Challenge for a week. Only six of the twelve that applied were accepted due to the mass number of applicants and the limited space at the camp’s new site in Winston-Salem. We are anxiously awaiting our end-of-year celebration and field trip on May 23 at Dan Nicholas Park in Salisbury. As a whole, Communities In Schools has had a great year at Lexington Middle School. We’ve had much praise from the staff for the assistance that we’ve provided with whatever problems and needs that occur with CIS students as well as the rapport with their families.